In a small room, in a massive convention center on a cool foggy morning in San Diego I was enjoying a cozy breakfast of oatmeal & blueberries and waiting for a man. That morning at the BlogHer '11 conference we had already done a 5K and yoga. We were exhilerated. In the room were a select group of bloggers who were lucky enough to score Breakfast with Bob Harper, the world renowned trainer from the hit NBC reality weight loss show "The Biggest Loser." I was delighted to meet bloggers from New York and Massachusetts (my home.) The room was buzzing with creative, happy women congratulating each other on the early morning run. There was no announcement made but you could tell something changed in the room. The air felt different. 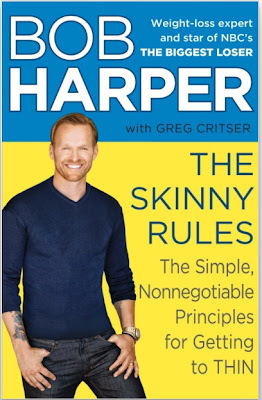 I looked up from my oatmeal and there he was-- Bob Harper. Bob doesn't walk, he bounds. He smiles and he bounds, taking the stairs to the small dais two steps at a time. I looked around me and noticed everyone, even security were glued to Bob and smiling. He just has that spark that you want to be part of. I've had the good fortune to interview some of the biggest celebrities in the world from film, television, music, sports and pop culture and there are some people who just have 'it.' George Clooney has 'it.' So do Angelina Jolie, Dustin Hoffman, Susan Lucci and Meryl Streep, President Bill Clinton and Alec Baldwin. John Denver and Mr. Rogers had 'it' as well. 'It' is that thing that makes you feel good when you are talking with someone. I don't think it has anything to do with looks really, it's more about confidence, an inner happy that they just can't contain. That's what Bob Harper has, the exuberance of someone who wants to bring out the absolute best in you because he sees it, even if no one else does--including you. I was so intent listening to Bob as he made eye contact around the room and started talking about his joy for fitness and good health that I forgot to turn on my iPad's audio recorder (a cardinal sin for a reporter! ), but later I got a chance to ask Bob some questions and this time I hit RECORD. Q: How do you keep your motivation going? Bob: We all have those days when we don't want to work out. Remember though how you feel after. It is a huge motivator. That is a huge motivator for a lot of the contestants that I have worked with. They don’t realize that all of our bodies want to be healthy. When our bodies are idle they are like "Come on! Give me the food I want! Come on move me around a little more!" and your body will respond in numbers. The numbers really show. You will drop your blood pressure numbers, your triglycerides and cholesterol . All these things are motivation for feeling better. The more information you have the better you will feel and that will keep you on this journey. The one thing I learned that I learned too, is that yes, losing the weight is hard but keeping it off is a challenge. That's the show right there. Remember how good it feels. You are in it for the long haul. People say "I am in it for a lifestyle change." You have to change you life. Lose all the wight but you can't go back after saying " I lost it all now let's go have pizza. It doesn’t work that way." Q: What is your happy music? Bob: I like British music, I like music from the UK. I think it's really great. There is a song from a British artist, Emeli (Sande). The song is called "Heaven." I played it this morning when I woke up. One of my other favorite songs is "Down with Trumpets." I saw a lot of head bobbing this morning when we were working out. "Down with Trumpets" is a really great song. Bob: Find what you are supposed to do in your life. Find what that calling is, that mission is and give it your all. I am so luck y that I get a chance to talk with a room full of you guys and have a great morning and kick around and laugh in the workout this morning. I love that. This makes me happy. Here is what is so great about Bob: He really wants to help you-- he does. He has this zest for life and he wants you to see what life can be if you live with healthy intentions. What you see on "The Biggest Loser" is real. The time he spends with contestants, motivating them on is real. Bob lives what he preaches which is evident in his new book "The Skinny Rules: the Simple Nonnegotiable Rules For Getting to Thin," a guide to eating healthy and losing weight for the real world. It would be impossible to follow the nutrition and exercise suggestions that Bob outlines in the book and NOT lose weight. It's about being sensible and following the rules of someone who has done the research and seen how it works by turning unhealthy people into extraordinary fitness warriors season after season on "The Biggest Loser." 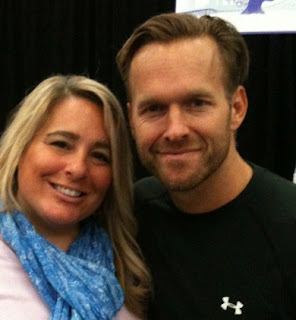 While there is a one in ten million shot of being a contestant on "The Biggest Loser" you can learn from Bob in his book, through his websites MyTrainerBob.com and Bob Harper's Fitness Club (Yes, I am a member!) and on Twitter. That morning in San Diego? That warm feeling I had? It wasn't necessarily just the oatmeal. It was knowing Bob Harper believed I could do it. He was certain that I could lose weight and feel strong and be The Happygirl. I had it in me all along. Thanks, Bob. We love a Happyguy!